On a system that fails to boot, the same System Recovery Options menu shown in Figure 4 contains a repair tool called System Restore. This menu item allows you to select from a history of saved restore points that are automatically taken by Windows Vista (if System Restore has been properly configured—more on this shortly). These restore points are taken every day and just before significant (potentially risky) system events, such as the installation of an application or device drivers. System Restore relies on an underlying service called the Volume Shadow Copy Service (VSS) that must be running for System Restore to take its “snapshots” of the system. If this service is stopped, you must start it before System Restore will function properly. System Restore is not enabled by default. You must turn on System Restore to have Windows Vista automatically create restore points. You do this on a healthy computer by clicking Control Panel > System and Maintenance > System > System Protection and then enabling Automatic Restore Points on each (logical) disk that contains system files. Remember that System Restore protects only the operating system and does not protect any user files, as shown in Figure 5. Enabling System Restore on disks that do not contain system files is useless. Figure 5. Enabling System Restore.  Enabling System Restore requires a reboot of the computer. After System Restore has been started, if a catastrophic software-based failure occurs that causes your computer to become unbootable, you can reboot on installation media, choose Repair Your Computer, and then initiate System Restore. You select which restore point from the list of currently available restore points. The system typically recommends the most recent restore point in an effort to minimize configuration and installation losses, as shown in Figure 6. Figure 6. Performing a System Restore. 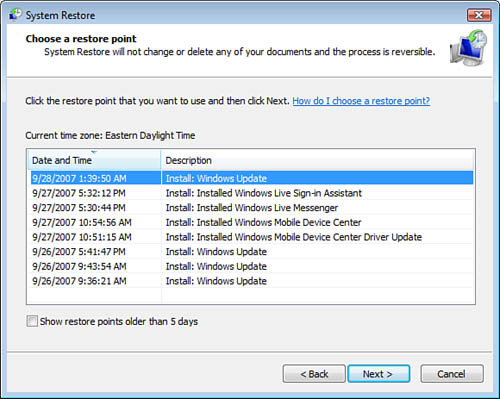 You can select this recommended restore point, or you can select a different restore point, as shown in Figure 7. Realize that your Registry and system file and application files are reverted to this point in time. You lose all configuration and installation information changes that have been made since this restore point when you perform a System Restore. Figure 7. Selecting an earlier restore point. The System Restore can be initiated from within an active and functional Windows Vista session for those times when you’ve simply changed your mind. No catastrophe required. This, again, can be initiated from Control Panel > System and Maintenance > System > System Protection, as shown in the earlier Figure 5. Then click System Restore. Just in case you’re about to do something tricky, you can manually trigger a restore point. You do this through the same dialog box you used to enable System Restore: in Control Panel > System and Maintenance > System > System Protection, click Create once again, as shown in Figure 5. You must be an administrator to create a System restore point. 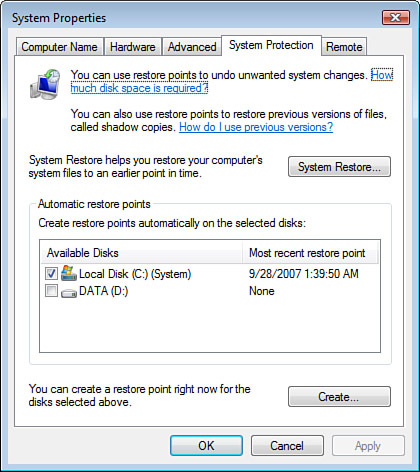 System Restore’s capability to create restore points is not enabled by default. You must turn on System Restore to have Windows Vista automatically create restore points, or you can manually create them. Until you have enabled System Restore and have created at least one restore point, you have nothing to restore. The menu item is available on the System Recovery Options dialog box, but there’s nothing to restore. 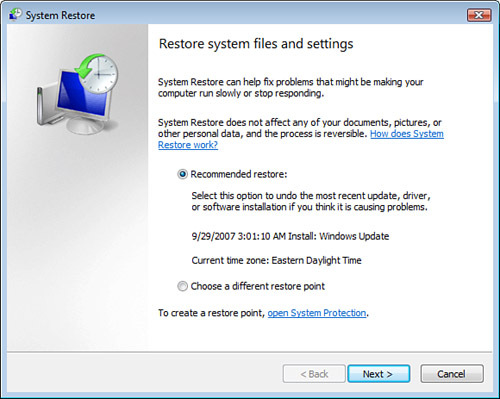 System Restore protects only system files and scripts, batch files, and other executables. The Plus: You can restore the operating system to an earlier point in time without overwriting current user data with older user data. No loss of user data at all. The Minus: If you must also protect user data (and you should), you must perform backups of the desired data using a separate process, in addition to using System Restore for system and executable files. System Restore can protect system files and executables only on NTFS volumes. It cannot protect system and executable files on FAT or FAT32 partitions. On dual-boot systems, earlier versions of Windows delete Windows Vista’s restore points.